You know the old cliche, a picture is worth a thousand words? Turns out that pictures have been deeply undervalued: A single photo can cost you your reputation, your job, even your freedom--if you post it online. Teachers, principals, firefighters, mayors, university presidents, and everyday people have all discovered the dark side of putting the wrong photos and videos on social networking sites. Sometimes they paid the price in embarrassment. An unlucky handful lost their jobs or landed in jail. The results aren't pretty, but they are sometimes hilarious. Here's our dirty dozen--12 pictures their owners probably wish they could take back. It's bad enough to dress up like you're about to slip a dollar under some toothless child's pillow. 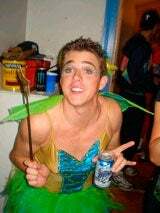 But former intern Kevin Colvin made it much worse by asking his boss at Anglo Irish Bank if he could take time off for a "family emergency in New York," then flitting off to a Halloween party dressed like a refugee from Peter Pan. Putting the faerie pix on his Facebook profile was the finishing touch. After his boss found the pictures, he responded by attaching the photo in question and blind-copied the entire office. Colvin lost his internship and what was left of his reputation when the e-mail messages went flying across the Internet; at least he got to keep the wand. Now that an ex-beauty queen is running for the VP slot, life may be easier for hot mommas who also happen to be office holders. It will be too late to help Carmen Kontur-Gronquist, though. The former mayor of Arlington, Oregon, got in hot water with her constituents after a family member posted photos to her MySpace profile showing off her, umm, political assets in the town firehouse (where she worked as an executive secretary). Amazingly, the town of 500 voted to recall her from office shortly after the photos went public. Maybe they were afraid people would start setting fires, just to see what she was wearing when she showed up. 3. Muscle Bound or Muscle Brained? What is it about firehouses that makes people want to take off their clothes? In this case, Boston fireman Alberto Arroyo got in trouble for stripping down to take part in a body-building competition last May. (He finished eighth in the 2008 Pro Natural American Championships, by the way.) There's nothing wrong with fire fighters showing off their muscles, but Arroyo made the mistake of competing two weeks after he'd filed for permanent disability status due to back injuries. Apparently his injuries enabled him to lift barbells but prevented him from inspecting buildings for code violations. After his bosses saw video of Arroyo competing on YouTube, they decided to give him plenty of spare time to work on his pecs. British tennis phenoms Naomi Broady and David Rice are no longer feeling the love from the UK's Lawn Tennis Association. The LTA nixed its sponsorship of the teens in October 2007 after discovering photos of Broady and Rice on social networking site Bebo showing them drunk, getting intimate with condom dispensers in public restrooms, and otherwise displaying "a lack of discipline." According to the Yorkshire Evening Post, "Naomi's Bebo profile showed her out on the town, with her legs wrapped round a toilet vending machine." No doubt trying to coax it to return the correct change. Quick, what's more stupid--driving 140 mph or filming yourself while driving 140 mph? How about filming yourself driving 140 mph and then posting the evidence on YouTube? That was only the tip of the dunce-berg for 23-year-old Andrew Kellett of Leeds, England. He posted more than 80 videos of himself driving recklessly, stealing gasoline, using drugs, and engaging in sundry other illegal activities under the name "Mrchimp2007." Last July, a city magistrate who'd had enough of this monkey business gave Kellett two years probation and ordered him to stop posting videos of his dirty deeds (though some are still available online). "Kellett must be in the running to be Britain's Dumbest Criminal," said Leeds City Councilor Les Carter. "If more criminals were as obliging, the city would be even safer."